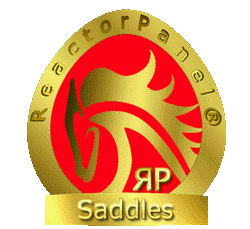 ReactorPanel® Saddles Anything else is just a saddle…..
Why Do We Use Sorbothane ®? This was Mango when he was rescued by one of our customers. he had one of the worst backs we had ever seen. Most back problems in horses are caused by badly fitting saddles, which over time may cause pain, discomfort and muscle wastage, sometimes resulting in behavioural problems, lameness and poor performance. For a few tips on checking your own saddle please see our Information page, Does Your Saddle Fit? What would cause my horse to be called a Remedial Horse? 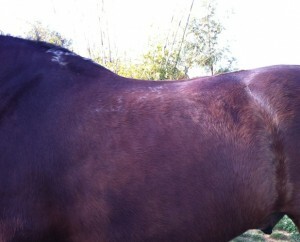 Previous ill fitting tack, this can sometimes result in white hairs, muscle atrophy and even behaviour problems. Injury that has caused uneven muscle development. You can feel uneven muscle if you run your hand across the saddle area firmly , with a little pressure.You may feel softer patches of muscle. Crooked riders or crooked horses who have remained untreated for a long period of time can cause uneven muscle development or muscle atrophy. Arthritis or similar on going health issues that have caused the horse or rider to compensate in his or her movement, which may in turn over time result in the saddle being moved to one side while being ridden. All horses and riders are asymmetric, they just vary in severity. A saddle that does not fit will exacerbate the problem and saddle will be sent to the weaker side causing atrophy on that side over time. Mango 6 months later, with a well fitting saddle, the right nutrition, work and massage he is recovering nicely. If the horse or rider is crooked they will need to be straightened by a Chiropractor or Osteopath, advice can be given by us to compensate if the horse has lost muscle due to asymetry to help aid recovery, if we can keep the saddle straight then with the appropriate ridden work, muscle work and exercises the wastage can recover. As the horses back starts to repair they may become sensitive as the blood flow returns to the damaged muscles as atrophied muscle is often lacking in blood flow. The saddle will need regular checks as the horses back repairs, some will change in a matter of weeks, and some will take considerably longer. We advise to get the fitter out as soon as you notice any changes. There will be a call-out fee for every visit, but we are happy to advise over the phone or by email, this is free. Firstly, not all horses do repair, but with patience and the help of your Saddle Fitter, Chiropractic Professional, Muscle worker or Physiotherapist and your Trainer, most horses do improve and some completely repair. As your horse develops more muscle in the damaged areas, he may become sensitive as the blood flow returns. It some times helps to have massage work carried out on your horse while he repairs, or to practise stretching exercises (carrot stretches etc) with your horse every day. 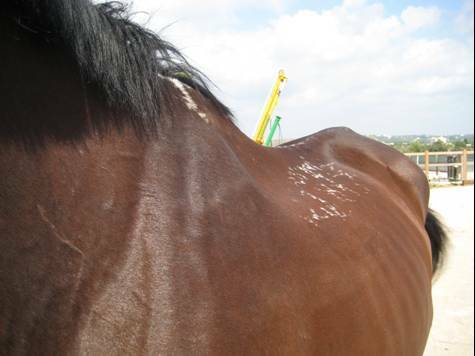 If your horse has had chiropractic work done to straighten out unevenness this may need repeating in a few months to keep on top of the problem. When your new saddle is fitted your horse should move more freely, please work him gently for the first week or two i.e. do not go hunting for 4 hours on your new saddle! Let it bed in and let the horse get used to being able to move all his muscles in a different way, as excessive work may cause him discomfort even if he is happy to work hard. Some horse’s muscles can change considerably in a matter of weeks, sometimes it can be very slow and gradual, and it depends on the horses breed, the way it is worked and the amount of work that it does. If the horse has damage under the saddle area, the front can often repair first, so if the saddle starts to tip backwards, ask your Saddle Fitter to visit and if needed to adjust the saddle. For those of you who are interested in Mango, here’s a video of him back in work and being ridden in his Reactorpanel jumping saddle. Or telephone the Saddle Fitter who fitted the saddle for advice. Autumn News …Our Lightest ReactorPanel Saddle EVER ! !